A window awning like canopy awnings can provide a very stylish, cosmopolitan look to your home. 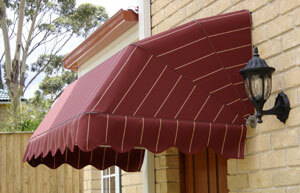 These awnings are available in a range of shapes and styles. They can be either fixed or retractable, and are suitable to install over windows, doors or walkways. 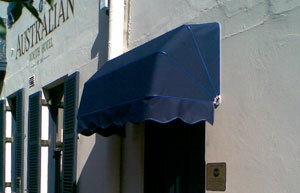 Canopy awnings are a very durable, low-maintenance choice of awning. Choose from a range of fabrics and colours to suit your outdoor decor. Get the right window awning for your home with Complete Blinds. Professional, Excellent value for money, terrific range, fabulous product. Complete Blinds is indeed the complete package. From the Sales person Dean who did the measure and quote, was full of terrific advice and integrity through to Kristie who was scheduling, and rescheduling ad infinitum because of my disgusting builder, the entire process was as pleasant and rewarding one could ever expect. Even David the installer left the place spotless and took the time to ensure every blind (in a two home duplex) worked smoothly and aligned appropriately. I would recommend this company without hesitation and if you are collecting quotes - you'd be utterly mad to not get one from Complete Blinds! (One happy customer here). Competitive price with amazing service and quality. Love my motorised blinds! Very friendly and efficient and would definitely recommend them to friends and family. What a lovely experience from the time i arranged a measure and quote from Terry at Complete Blinds who was fantastic to the installation by David who was organised ,quick ,professional and by far the best fitter i have had in my life. I had three quotes and not only were they far cheaper, but they arrived before the time given . I am retired and have been in sales for 35 years and i have never dealt with anyone where the whole experience was as good...A customer forever. Complete Blinds - Quality Product and Superior Service. We got quotes from a few places. We originally liked the Luxaflex quality, but it was too expensive. When we walked in to Complete Blinds showroom in Bella Vista we liked the quality. The lady at the showroom was friendly and took a lot of trouble to explain things. Then we decided to get a measure and quote. Troy who is one of the owners came to measure and quote for us. Troy was able to explain the options and help select a suitable color for all our rooms based on wall and window colour. Troy was very friendly and helpful. We were happy with the product and quote so we ordered the product. It was delivered on time. The installer called Pedro was meticulous and fixed everything well. He was very amicable too. In conclusion, we are really happy to recommend Complete Blinds to any of our friends. In fact we are planning to get awnings from them now. We can get Luxaflex awnings through Complete Blinds. Thanks to the team at Complete Blinds, I recently had my Motorised Roller Blinds and Norman Shutters installed by Pedro. Seamless service from start to finish. Will be recommending in the future to family and friends. Shutters are amazing! Thank you for following through with our plantation shutters. The replacements really have provided a better line, both inside and outside to our large triangular window. The approach that you all took in dealing with the situation provides tangible evidence of your commitment to “customer satisfaction”. We will confidently recommend Complete Blinds to members of our family and to friends. I’m writing to express my complete satisfaction with the service I received dealing with your company. Too often good service is not acknowledged and its good service that makes companies so successful. Right from the first call. The enquiry was handled with extreme professionalism, followed by a visit from Mark who was very polite, knowledgeable and professional and finished off with Jono who was amazing. These people should all be acknowledged. They are a credit to your company. I’m delighted with my shutters and I have no problem with recommending your company to anyone looking for window treatments. We wanted to write to you to thank all the staff at Complete Blinds that have been associated with our request for service, from Mark (Rep), to Leah and the installers you truly have a great team who are professional, pleasant to deal with and exemplify premium customer service. It is teams like this that make a Business truly high performing. Please take a minute to thank them for us…we would recommend Complete Blinds to all our family and friends. Well Done !! Just want to give some feedback on the blinds – they are excellent and installed to perfection – really impressed!! From the first phone call all the team were a pleasure deal with. They gave us courteous and prompt service with their wealth of experience. When our salesman Dean, told us the time frame for delivery, it was spot on. Of course, I had 2nd thoughts about the hue of the cream colour of our shutters which we were going to order. Dean came back and we nutted out the colour again, it is perfect. Blake installed them yesterday and he is also a credit to Complete Blinds. He was very pleasant and obviously knows his trade. He took pride in his work and respected our floors and coverings on a very, very wet day. Thought it appropriate to let you know how pleased we have been with the professionalism of all our contacts with your company from the Home Show at Homebush through to the installation of a number of shutters and awnings in our house yesterday. Apart from being very helpful, knowledgeable and friendly from the original crew at Homebush and then Troy measuring through to Johnno installing, all dealings have been pleasant and professional. Johnno went about his work without fuss, cleaned even the smallest amount of dust after drilling and was very friendly from the outset. When he left you wouldn’t have known he’d been here – apart from the new shutters and awnings that is! Well done – would you please pass on our thanks to all concerned. Just a note to say that Gloria and I are very grateful for the superb curtain installation you arranged today. We will certainly recommend your company to our neighbours. My husband and I wanted to thank you for the exceptional customer service and friendly, well informed advice we received from you. We ordered plantation shutters from you in November and they were installed in the week of Christmas 2014, just as you had promised. You delivered exactly what was discussed and your office kept us well informed. It is not often that we have experienced good service, time management and communications, so we would like to express our appreciation. We are extremely happy with our new plantation shutters, they look fantastic and give the whole house a more modern look. Thank you again, we will certainly recommend you and your team. I also just wanted to thank you – the blinds look wonderful. I have had exceptional service from everyone at your company, from Dean (who came out to quote), to Pedro (who had the difficult job of installing) and thanks again for having the blinds installed this week prior to guests visiting from UK over the weekend. Pedro has done an amazing job and was extremely clean, polite, helpful and professional in his installation process. I actually obtained about 5 quotes for my blinds and while yours wasn’t the cheapest (although not the most expensive either), I thought the value for money in terms of quality of fabric and installation process was far superior to others. I am happy with my choice! I will definitely recommend your firm to friends. I just wanted to say how happy I am with our new blinds that were installed today. They look fantastic, and I am very grateful for the professional and friendly advice provided by Dean at the planning stage. Today Pedro installed the blinds quickly, efficiently and with minimal mess. Neither of them could have done any more to ensure that the product met our needs. Leah in the office was also a pleasure to deal with. So less than a month after paying our deposit we can enjoy the fresh look and the insulation benefits of our new blinds. Thank you to all concerned, and keep up the good work! We wanted to express our gratitude of how much we enjoy our new blinds. They are of top quality and the service we received was incredible. Furthermore, it was done in a timely manner and the professionalism that was displayed by your installers was exceptional. Thank you so much! Hi, Just a note to let you know how thrilled I am with my blinds and shutters. Everyone that I have dealt with from Complete Blinds has been professional, organized and helpful. From the first day I came into your showroom I was treated like royalty. Thanks once again for the excellent job you have done – my house now looks finished. Just wanted to let you know that we love our new blinds. They turned out better than we had hoped….. Great customer experience. Absolutely beautiful shutters – we now can see out without being blinded by the afternoon sun. Look forward to ordering again. Thank You! Thank you so much for such a quick response to my email. I really appreciate your professional service. I just wanted to express my sincere appreciation for your help and understanding with the huge job you have done – we will definitely be ordering more for our living room & family room windows. Thanks again! Thank you very very much, you were so helpful and unlike other companies who didn’t even bother to answer my emails you did what you said you would do! I will contact you tomorrow to place my order. Complete Blinds was established in 1989. The secret to our success is in delivering quality, specialised blinds, shutters and awnings on time, and giving our Sydney customers the highest level of craftsmanship and service. At Complete Blinds Sydney, we have an extremely high standard of craftsmanship, and supply only the very best in blinds and shutters. We train our own craftsmen and guarantee control over quality, installation and delivery, by refusing to use sub-contractors. We are committed to the satisfaction of you, our customer. Our service includes personalised, one-on-one consultation in your home, to design the window coverings that best suit you and your lifestyle. The strength of our company means we have maximum buying power, and can pass on affordable prices to you when you buy your blinds and shutters. We watch market trends, and listen closely to customer feedback, to provide the kind of services and value for money that you deserve. Copyright © 2018 Complete Blinds.